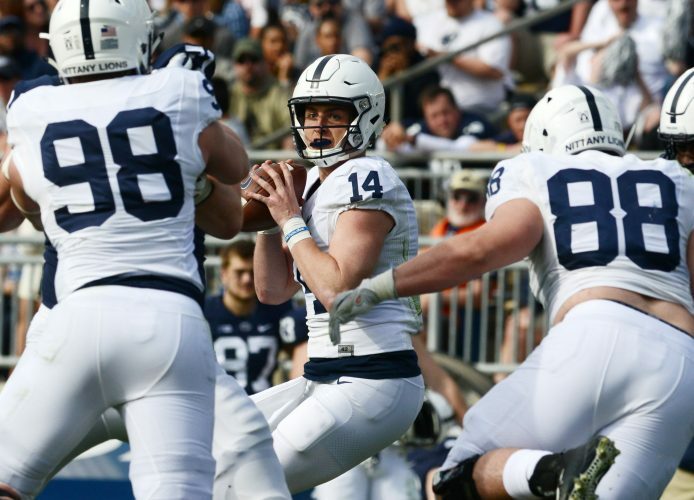 Play of the game: Trace McSorley zinged a 43-yard pass to redshirt freshman K.J. Hamler in the second quarter. Hamler fumbled after the catch, and Jesse Luketa recovered. 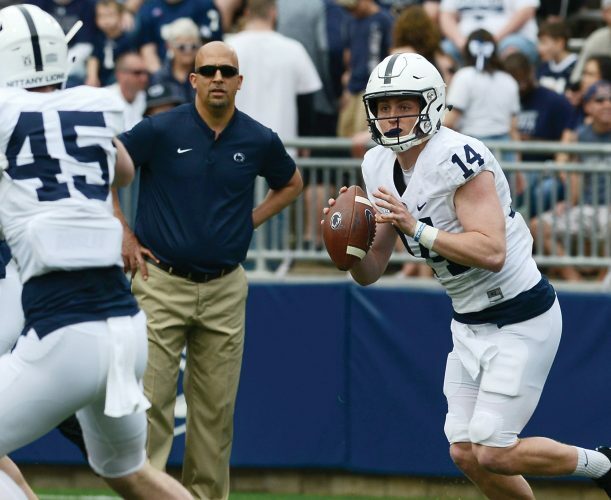 The play showed how McSorley will be looking for new targets, some of whom will need acclimation. Offensive player of the game: Redshirt freshman receiver Mac Hippenhammer (Blue) caught four passes for 43 yards and two touchdowns. Defensive player of the game: True freshman linebacker Micah Parsons (Blue) made a team-high eight tackles, including one for loss. Most telling statistic: The White team converted just one of nine third-down opportunities. Most deceiving statistic: The Blue was called for four of the game’s five penalties, totaling 42 yards. Hidden statistic: The White managed just two rushing first downs. Best run: Mark Allen hit the hole quickly in the first quarter and broke three tackles en route to a 19-yard gain. Best pass: Sean Clifford threaded a 29-yard touchdown pass to Hippenhammer with 1:44 remaining. Best catch: Didn’t see one during the game so we’ll go with band director Gregory Drane, who hustled to make a running grab of a short punt in the halftime competition. Catch it, will ya: Tyler Shoop dropped a ball for the Blue on the last play of the third quarter. Wide receiver Justin Weller dropped one for the White in the third quarter. Hold it, won’t ya: Hamler, as mentioned in the play of the game, fumbled away a reception after a 43-yard gain in the second quarter. Johnathan Thomas fumbled in the third quarter. The game’s two fumbles, and only turnovers, belonged to the Blue team. Stay up, please: Journey Brown caught a kickoff in the first quarter but the momentum made him fall backwards. Best tackle: Backup linebacker Jason Vranic dumped Miles Sanders behind the line of scrimmage for a loss in the second quarter. Best hit: White cornerback D.J. Brown drilled Allen at the sidelines following a first-quarter completion. Best coverage: Cornerback Zech McPhearson had the post covered well on a deep pass in the first quarter, saving a touchdown. He wound up breaking up three passes. Best kick: Carson Landis kicked a 34-yard field goal for the White in the third quarter. Best call: The Blue ran a reverse with Hamler gaining 10 to the White 2-yard line in the second quarter. Worst call(s): There were a number of quarterback read-option runs (six) with McSorley. It’s a staple during the regular season but the quarterback can’t be hit in this game. Best effort: Allen caught a short pass from McSorley at the White 2 and made several moves that only gained a yard but exhibited a fine effort. Unsung hero: Landis punted six times (handling the duties for both teams) for an average of 42.2.